A not uncommon trait in Morgans is their tendency to shake, rattle and roll – to borrow an expression from a ‘50s rock and roll song – at certain speeds. Additionally, Morgans can sometimes steer in an unintended direction on bumpy or uneven roads – a most disconcerting and dangerous habit. Firstly, you want the damper to act at the point where it will work most effectively. I chose to attach it to the tie rod as this acts directly on the axle through a pair of ball joints. 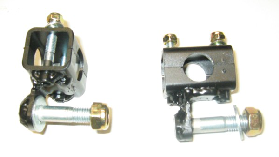 I have seen versions which attach to the drag link but this adds another ball joint between the damper and the axles and thus introduces some undesireable slack between the damper and the axles as the ball joint twists under load. Secondly, choose your damper carefully. There is approx 150mm of movement in the tie rod from lock to lock, therefore your damper must have at least this amount of stroke. I first bought a VW Beetle damper which turned out to have only 135mm stroke. If I had used it the car would have had a smaller turning circle and the damper would come under inappropriate loads at full lock. Fortunately, I was able to exchange this for a Mercedes Benz damper made by Bilstein which has a generous 200mm of stroke and is perfect for the job. All that was left to do now was to fabricate some brackets to hold the damper in place. These are shown in the photograph. The final result is most pleasing – the cars thus fitted (Plus 8s and a 4/4) have all been much nicer to drive with virtual elimination of the nasty habits mentioned in the opening paragraph. There is a slight increase in steering effort which is far outweighed by the benefits. I made some extra brackets while doing this job and these are listed in the Products section. The above brackets fit a Morgan with the older Burman or Gemmer steering box. A kit for rack & pinion steering is now also available here's one fitted to a Plus 8 (Courtesy of Tom Fairhall). See what other Morgan owners who have made this modification say. My thanks to my partner in crime, Peter Canavan, who volunteered his Plus 8 for our initial experiments in the shed. We subsequently fitted dampers to Peter’s 4/4 and my ’75 Plus 8.